John Dougherty, the politically powerful boss of Local 98, now faces federal corruption charges. Dave Davies has covered local politics and government in Philadelphia for more than 30 years. He is currently senior reporter for WHYY, and a contributor and fill-in host for Fresh Air with Terry Gross. He was reporter and columnist for the Philadelphia Daily News for 19 years, and before that was city hall bureau chief for KYW News Radio and city hall correspondent for WHYY. He’s a Texas native who’s spent his working life in Philadelphia. Before getting into journalism, he worked as a teacher, cab driver and welder. (Philadelphia) — The federal indictment charging electrician’s union leader John Dougherty with a long list of crimes didn’t just wound a powerful labor union. It could take down the most prolific political spender in Pennsylvania, a kingmaker who’s helped elect mayors, governors, lawmakers and judges for more than two decades. The political committee of Dougherty’s union, the International Brotherhood of Electricians Local 98, typically gives more than $2 million a year in donations to candidates and political committees, and that doesn’t include its spending on field operations and other political work. Democratic strategist Mark Nevins said the removal of Dougherty, known widely as “Johnny Doc,” from the political game would have far reaching impact. A key question for the moment is whether Dougherty’s indictment will weaken Mayor Jim Kenney’s chances of re-election this year. Local 98 contributed $450,000 to a Super PAC that supported Kenney’s winning effort four years ago, and raised large sums from others for the committee. 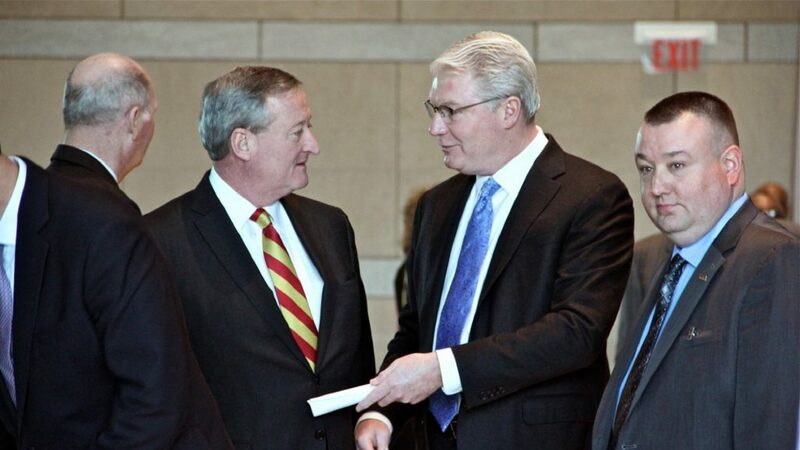 Labor leader John Dougherty talks with Mayor Jim Kenney during an event at the National Constitution Center celebrating Kevin Dougherty’s election to the Pennsylvania Supreme Court in 2015. Alan Butkovitz, the only announced candidate to oppose Kenney in the Democratic primary, said in a phone interview it’s hard to see how the union could replicate that effort this spring with Dougherty under indictment. Butkovitz said Kenney would miss Local 98’s money, and perhaps even more important, Dougherty’s fundraising ability among other building trades unions. “If he loses John Dougherty, he doesn’t have anybody of that stature or that power or that impact that could equal the effort that John Dougherty put into it,” Butkovitz. Nevins said Kenney is in a better position to do without Local 98’s help than he was four years ago, because he’s an incumbent with a record to run on. There’s also the question of whether voters will think less of Kenney when one of his key supporters is an accused criminal. Kenney declined to comment directly on the indictment when asked Wednesday, but noted that no one in his administration was involved the case. He also seemed to downplay his political ties with Dougherty. “Mostly every union in the city has supported me, along with other folks who are in the business community,” he said. Kenney told the Inquirer Wednesday he intends to go forward with his re-election fundraiser Thursday hosted by Local 98. He said the contributions come from members, not the union leadership. “I’m a union mayor. And I support union activities and union work,” Kenney said. Beverage industry interests have invested heavily in trying to defeat Mayor Kenney’s soda tax, and could support a candidate against him in this spring’s Democratic primary. A reduction in Kenney’s financial support could make that option more attractive. In addition, FBI tape transcripts included in the indictment seem to indicate that Dougherty supported the soda tax to exact revenge on a Teamsters local he was feuding with. Butkovitz said that revelation will harm Kenney in the election by raising questions about the true motive for imposing the levy. Kenney said the comments in the indictment have nothing to do with his support for the tax. Anthony Campisi, spokesman for a coalition opposing the beverage tax declined to comment Wednesday. Philadelphia State Sen. Anthony Hardy Williams, who lost to Kenney in the 2015 mayoral primary, has said he’s considering another run this year. 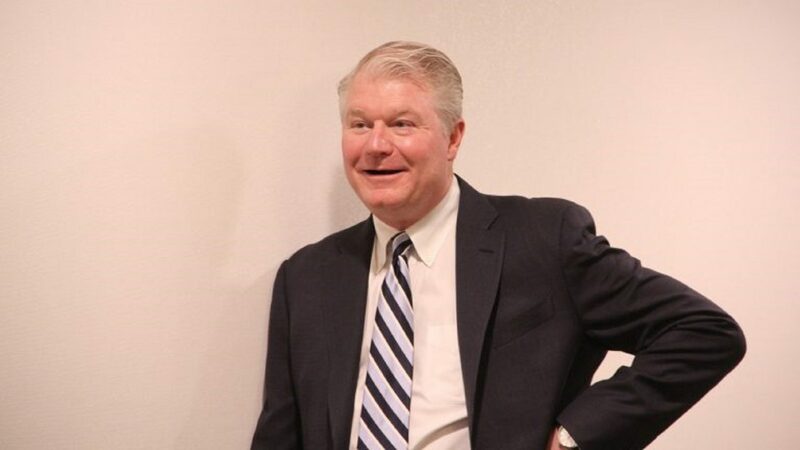 John Dougherty’s brother Kevin Dougherty was elected to the Pennsylvania Supreme Court in 2015 with heavy support from Local 98 and its allies. 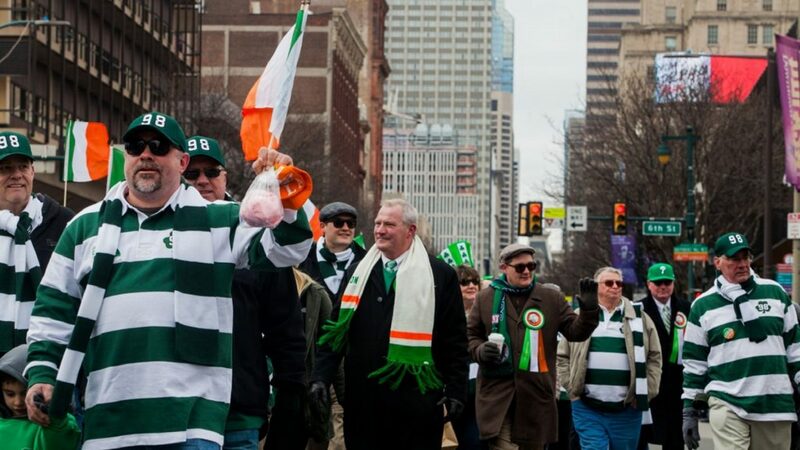 State Supreme Court Justice Kevin Dougherty, brother of indicted union boss John Dougherty, marches with Electricians Local Union 98 during the Saint Patrick’s Day Parade Sunday, March 12, 2017. He’ll face a retention re-election in 2025, the kind of race that Pennsylvania jurists practically never lose. What if the indictment doesn’t take Dougherty out of the political game? First Assistant U.S. Attorney Jennifer Arbittier Williams said in response to reporters’ questions that the prosecutors have no plans to seek Dougherty’s removal from his union post while he’s awaiting trial. It’s unlikely the U.S. Labor Department would act to remove Dougherty, according to a labor law expert I spoke to. The national leadership of the IBEW could take some action, but they had no comment when contacted Wednesday. So it’s possible that for the municipal election cycle ahead, Dougherty could remain in charge of the union’s political fund, which showed a balance of $7,186,933 at the end of 2018. In the 2015 city election cycle, besides its $450,000 Super PAC effort for Kenney, Local 98 spent money to help at least 12 City Council candidates, Democrats and Republicans. Will candidates be willing to accept money from someone under indictment? Also charged in the indictment is City Councilman Bobby Henon, a former political director of Local 98 who continues to draw a union salary while serving on Council. He’s accused of committing honest services fraud by serving the interests of John Dougherty rather than his constituents. Henon has said he won’t resign, and he’s presumably one candidate who won’t mind accepting Dougherty’s help under the circumstances. 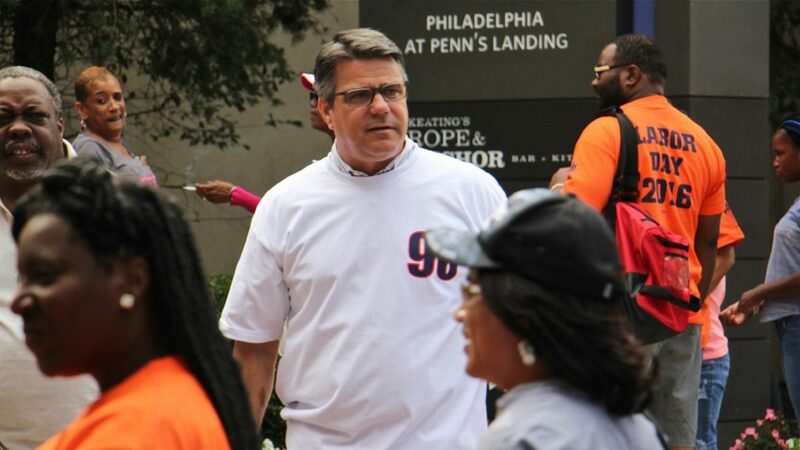 Philadelphia City Councilman Bobby Henon wears a Local 98 T-shirt at the Labor Day parade in 2016. Henon’s office at City Council was searched by the FBI a month before. But Henon is up for re-election this year like all Council members, and the charges against him are likely to attract other candidates from his district in lower Northeast Philadelphia. Mayor Kenney also didn’t call for Henon to quit, saying that decision is up to him. The primary election is May 21. WHYY is the leading public media station serving the Philadelphia region, including Delaware, South Jersey and Pennsylvania. This story originally appeared on WHYY.org. Disclosure: The Electricians Union Local 98 represents engineers at WHYY.